On Saturday, January 13th, 75 UI players from Nobel, Faraday, and Morton elementary celebrated the unifying powers of sport by participating in Nike’s Basketball Clinic at Marshall High School. 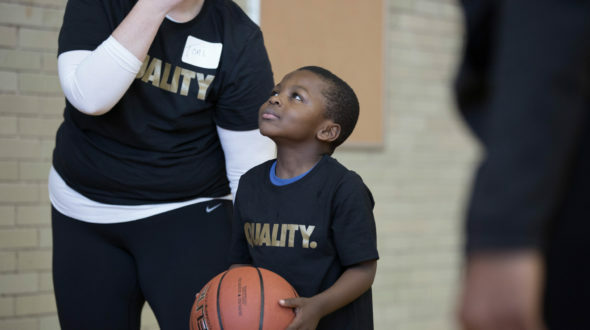 Sporting “Equality” campaign t-shirts, Nike volunteers welcomed eager UI athletes with an energizing full-court human tunnel. Afterwards, players were split up into small groups, and began rotating through various footwork, defense, shooting, and dribbling stations led by UI coaches. High fives, shouts of encouragement, and beads of hard-working sweat immediately began to fill the historical gym. 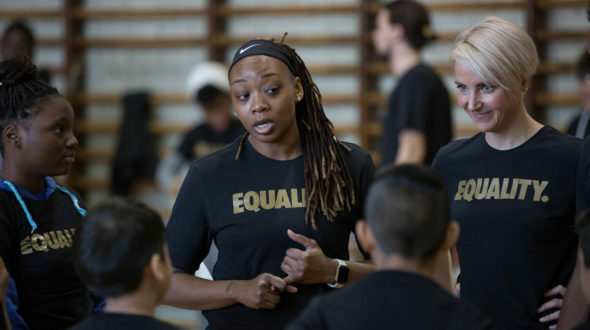 In addition to working on their basketball skills, UI players were able to tour the gyms decked out with giant images of diverse and successful Nike ambassadors, as well as visit a photo station where their photo was taken and shared to a large “Equality” poster collage. 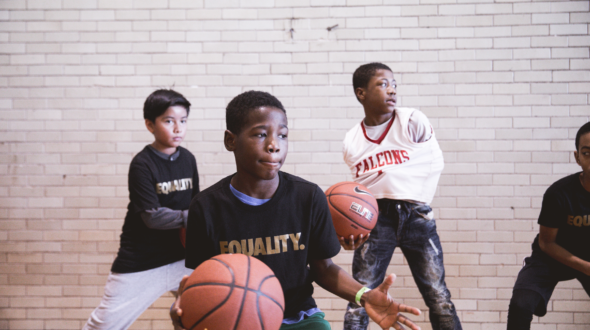 In conjunction with the annual MLK Dream Classic, this clinic served as a way for Nike employees to connect with UI participants and celebrate Nike’s “EQUALITY” campaign mission: Using the power of sports to bring people together in their communities. This message is reflective of Nike’s values, but also directly mirrors Urban Initiatives’ mission to unify diverse stakeholders to support Chicago’s youth. Urban Initiatives is so grateful that in addition to supporting our programming through the Nike Ever Higher Fund and their in-kind support, Nike invites our students to events like this one. It was an amazing day of celebrating the diverse voices and people that make connecting around sport so fun. Huge thanks to Nike Chicago for valuing the importance of sport to bring our community and kids together. Until we all win! Previous Article: Quest Foundation Sustains Support!